I spent ten happy months on a CHASE-funded placement at the Science Museum in 2016-17. 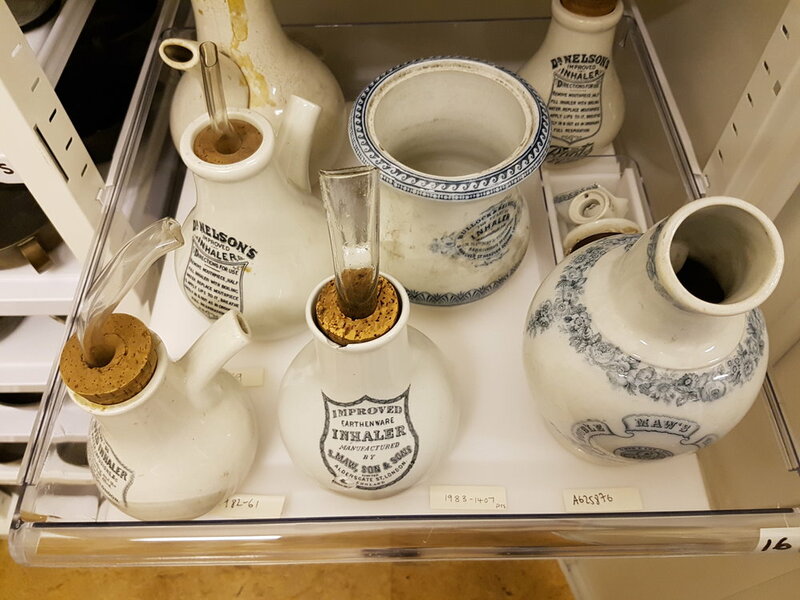 Working in the Medicine collection, I split my time between my own collections research and investigative projects for the museum. The museum is due to launch a major refurbishment of the Medicine Galleries in 2019, so it was an exciting time to be involved in their work. My research focuses on the role of material objects in experiences of illness, and how literary writers represent these experiences. At the Science Museum I focused on objects relevant to the authors I’ve been researching – stomach pumps in relation to Virginia Woolf’s overdoses, X-ray machines similar to those featured in Thomas Mann’s work, and prosthetic limbs relevant to the work of Flannery O’Connor, for example. I also produced three reports for the museum itself – an audit of the Psychology Collection and two reports on object collections from Victorian asylums. This involved research trips to archives in London and Suffolk, trying to track down more details of obscure nineteenth-century institutional technologies (a ‘tell-tale clock’ used to track warder patrols, anyone?). Once I had been given training in object handling and hazard awareness, I was given free rein of the Medicine collection and online database. This meant that I could carry out really targeted research. I also took part in departmental meetings, giving me a good insight into the workings of a major national museum. One of the most useful elements was meeting other researchers working across a range of areas of medical history, some of whom are now close friends. We were also able to attend the staff private views for the new Wonderlab gallery and Robots exhibition, which was a lovely bonus. A few practical points in case anyone reading this is thinking of taking on a placement: the internal training took some time to access, so I would recommend building lots of cushion room into your plans if you possibly can. If your placement is of direct relevance to your research (as opposed to a more internship-style placement, for example), I would also recommend considering a part-time arrangement. I applied for the maximum six months’ funding but stretched out the working days over ten months. It was helpful to be able to incorporate my new findings and thinking into my writing as I went along, rather than feeling that I was shelving the thesis in the meantime. I’d also stress that, if your ‘ideal’ placement or host partner isn’t listed on the CHASE website, you might be able to negotiate something from scratch – my placement began from an email enquiry and, with lots of help and support from CHASE, grew from there. Working directly with objects allowed me to reflect on the value of material sources, and how much they can tell us about how we conceive of shared histories. 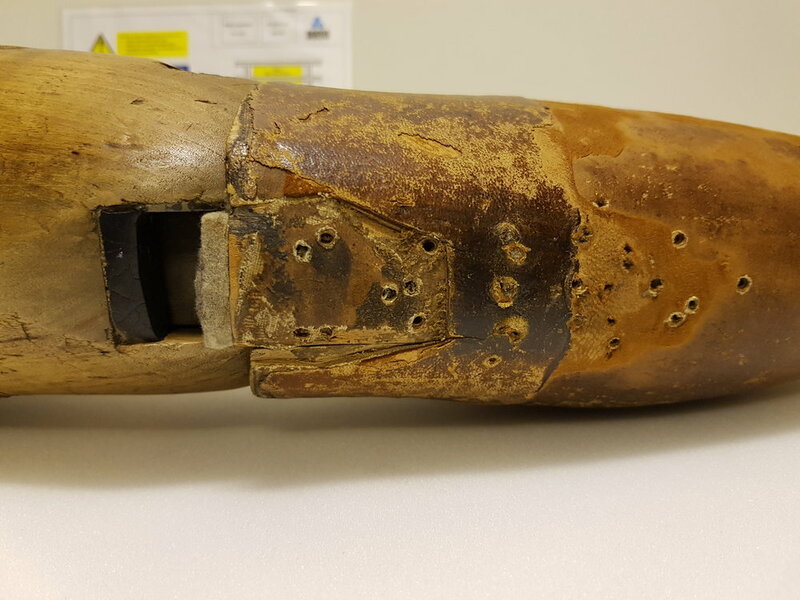 Material evidence gives us additional and sometimes crucial information on the often surprising origins and usage of an object – the signs of repair on a beloved prosthetic leg kept far beyond its ‘natural life’, for example, or the use of surplus domestic lace for World War One bandaging. However, I’m increasingly convinced by the need to work simultaneously across text, object and theory; the medical objects accompanied by a piece of oral history, or even the smallest scrap of evidence about their origins, were infinitely richer than those that had been collected with no supporting information at all. This realisation sounds rather obvious, but it helped me to examine and rethink the methodological assumptions underpinning my thesis. Being in the collections also helped me to understand some of the knottier, less glamorous questions faced by curators, collectors and conservators. For example, Henry Wellcome collected multiples of the same object: do we really need to spend time, energy, space and materials preserving and storing 80 identical forceps when, say, five would probably be enough? How do you handle or dispose of historic items that you wouldn’t have chosen to collect in the first place, especially if you have an implied obligation to preserve them? How do you articulate your curatorial choices to a public audience in an engaging way? I have a much better understanding now of the issues which museums will face as money and space gets more and more squeezed. I’m so glad I took up the opportunity of a CHASE placement. Huge thanks go to CHASE and the Science Museum (particularly Steve Colburn, CHASE Placements and Partnerships Officer, and Oisín Wall, Research Curator at the Science Museum) for a truly enriching experience.